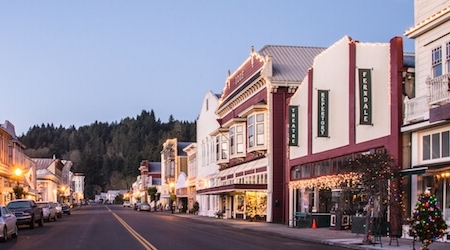 Ferndale is located 270 miles north of Sacramento and San Francisco in scenic Humboldt County, halfway between California Highway 101 and the Lost Coast and a short 30-minute drive from California redwoods parks. Getting here is half the fun: It's a breathtakingly beautiful drive through vineyards, hills and redwoods from the nearest major airports - including Sacramento, San Francisco, Oakland, and San Jose. If you're traveling from the Pacific Northwest, Ferndale is just 100 miles south of the Oregon border. Or fly into the California Redwood Coast – Humboldt County Airport, 45 minutes north of Ferndale (car rentals and shuttle service available). From Highway 101, take the Fernbridge/Ferndale exit. Cross historic Fernbridge and drive through five miles of pastoral views to Ferndale's historic Main Street.